Prior to his State of the State address, Gov. 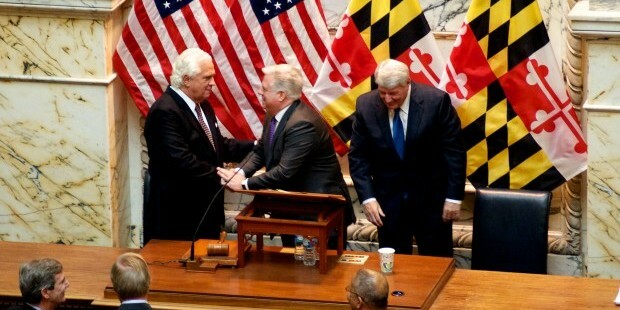 Larry Hogan, middle, shakes hands with Senate President Mike Miller and House Speaker Michael Busch looks on. If there is one area where Gov. Larry Hogan Jr. can sing “kumbaya” with Maryland legislators, it is economic development. The path has been blazed for him by the legislature’s Augustine Commission. A year ago, top Democrats in the General Assembly recognized Gov. Martin O’Malley had badly dropped the ball on growing jobs in Maryland. So they assembled a commission, led by former Lockheed Martin Corporation CEO Norm Augustine, with the assignment of suggesting how to turn things around. The group made 32 recommendations, all sensible and none of them particularly novel. It won’t take much for the Republican governor and Democratic legislators to find agreement on most of those suggestions. Underlying the bipartisan nature of the commission is the fact that Hogan’s new budget secretary, former State Sen. David Brinkley, served on the panel alongside Republican Del. Wendell Beitzel. Two key Democratic chairmen, Del. Dereck Davis and Sen. Ed Kasemeyer, served on the commission, too. Consolidate economic development programs, develop one-stop shops for businesses and put more emphasis on technology industries. Reverse the state’s hostile, rule-enforcement driven approach toward businesses through customer-service training and a new, “what can I do to help?” attitude. Invest state money in university-generated business development and address the needs of underperforming public schools. Focus on unskilled high school graduates who need vocational training and apprenticeship programs. One of the more shocking findings of the commission is that 44 percent of kids in Maryland public schools qualify for free or reduced-price lunches, and most of them come from minority families struggling to eke out a living. The Commission said the state’s public schools aren’t giving them the right kind of education. These kids graduate without the tools to find jobs. Their path up the economic ladder is blocked. Even worse, there are jobs out there for them — some 132,000 currently unfilled positions in Maryland. Employers told the commission they simply cannot find in-state workers who possess the right technical skills. This glaring mismatch between education preparedness and job qualifications is one of society’s neglected weaknesses. Educators haven’t addressed it. Neither have the politicians. They are too focused on creating college-prepared students. Those from the lower rungs of education are left to flounder with few, if any, employable skills. Hogan and legislators can start addressing this situation with some quick fixes. Find a pot of money for the state’s community colleges, which already lead in offering job-training and apprenticeship programs. What’s missing has been a major financial investment from the state and local governments in these specialized skills courses. The state also needs to offer local school systems extra funds if they are to bring back vocational education in a big way. High school students, especially those not interested in college, should be pursuing career paths and job-readiness courses. Such an approach is sorely needed in low-performing districts like Baltimore City and Prince George’s County and in rural jurisdictions where employment opportunities are limited. The good news is that both Hogan and Democratic leaders in the General Assembly are singing from the same hymnal. If each side fully commits to the objectives laid out by the panel, Maryland actually could make progress in growing its business base and creating a workforce that is job-ready. Barry Rascovar’s blog can be found at www.politicalmaryland.com. He can be reached at brascovar@hotmail.com.